Good quality, pretty light. But some strange quirks. 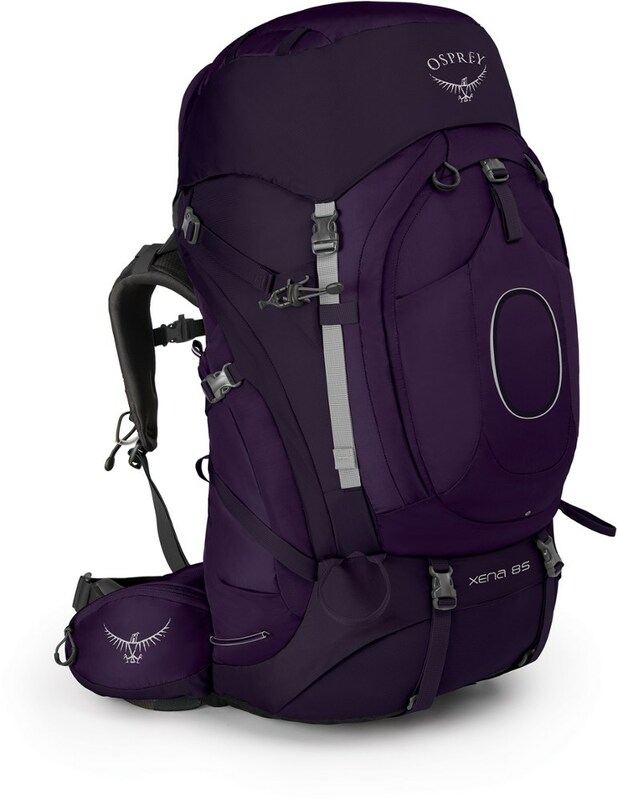 To be clear: this is about the pre-2019 pack. The picture here is the 2019 version. It is made in Bulgaria and currently costs 112 euros. 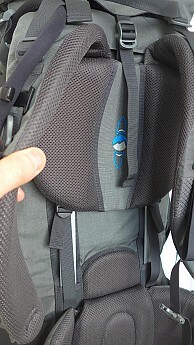 The 2019 version differences as far I can see: 200 grams lighter, has two axe loops instead of one, two extra eyes on front, a different setup of the side compression straps, and a different way of tucking away the front compression straps. This is a multipart review. First, I will discuss the pack as is. But I will also go into what could be improved on pretty standard packs like this. Finally, I will briefly address some adaptations I already made or intend to make. A bit more context. I have a faithful 15-years-old Lowe Alpine Alpamayo 80+20. 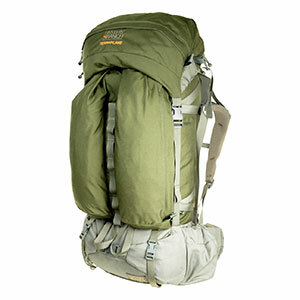 It is very robust, but also quite heavy: 2,7 kilograms. I mainly use it carrying a week's groceries. 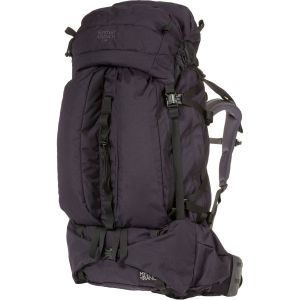 For winter trekkings it disturbed me being so heavy, but a much lighter pack of 45-55 litres was too squeezy. 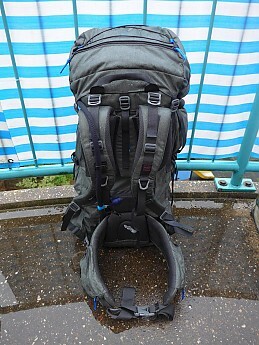 I seized the opportunity to buy this pack, secondhand but unused, even though some details were not to my liking. I considered buying a new Tashev model as they are pretty cheap. But my main objection had not changed. Basically it seemed a good pack, and by how I bought it, it was even cheaper. So it enabled me to just try it out, and maybe turn it into a project, as I tend to adapt gear. 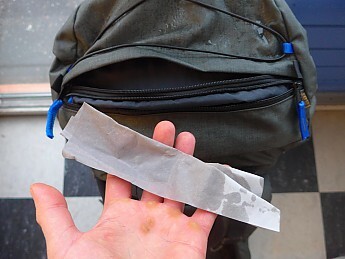 I have used it during one winter trekking and one a bit rainy training, after which I left it out in the rain some more. 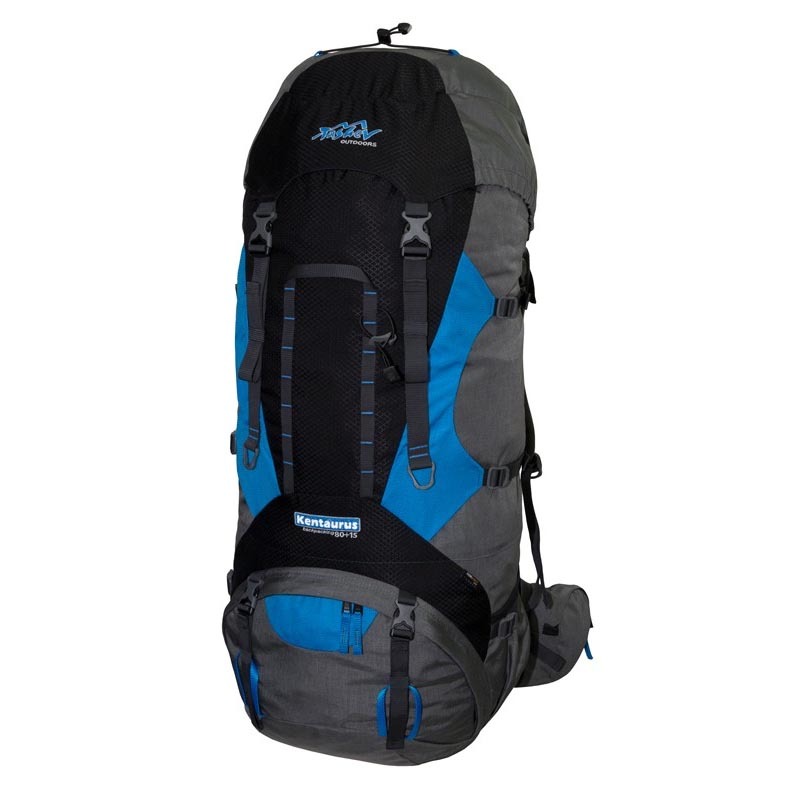 This pack falls into a category of large packs with mostly standard features, as you can see on the pictures. 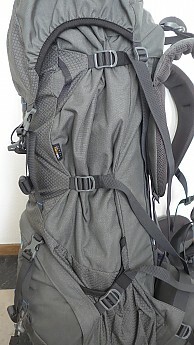 The back length is adjustable, the main compartment can be divided and has an extra zipped entry, it has two top pockets in the lid and an extra made of webbing underneath, it has a drinking pouch inside with a port and a outside clip, one axe loop, thump loops, an extra handle on the front, pouches on the sides and on the belt, stabilisation at the top and sides, compression straps on the sides, back, and front, a draw cord on top, two elastic straps for poles or an axe, various eyes for attachment, a clip for the loose end of the hip belt, some gimmicks to tuck away the various compression straps, and two sort of key cords in the two top pockets. 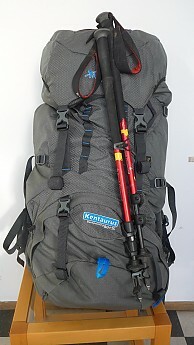 My pack was a bit heavier than the current version: 2,2 kilograms. 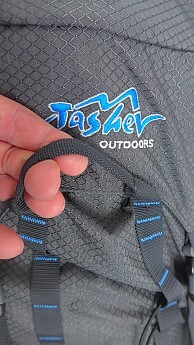 Tashev is usually praised for use of good materials. I agree, the all important zippers seems robust, buckles and eyes seem not vulnerable to fracture, the cloth seems pretty water resistant, and workmanship is fine. Weight is pretty modest for this size, I personally shed 0,5 kilograms compared to the Alpamayo. It has all the usual features, plus some added gadgets. I had no experience with belt pouches. Now I consider them useful for carrying food and trash. They are well made with covered zippers. 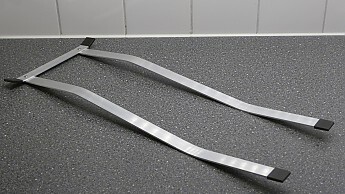 The elastic straps worked well for poles, though I had to move the upper one down to stay clear from the lid (picture). The second handle is odd too (picture). I do not need it and it is vulnerable to tear. There is a centre lid drawer which inconveniently covers the handle when the lid is open. It is useful (noticing after removal) but unpractical. I missed a second axe loop, in case I would climb with the pack. 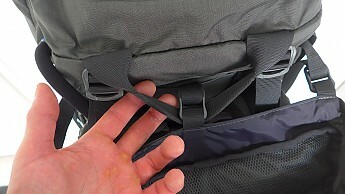 The zipper of the second top compartment is not covered and rain gets in (picture). 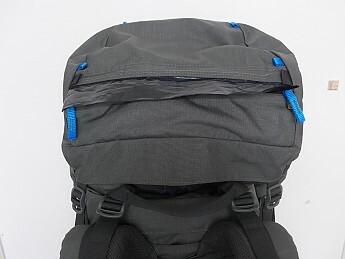 This already is a bit of problem with the first top compartment when the lid is tilted forward, as is usually the case (picture). That is because the zippers are put behind the head, instead of on the side like in my Alpamayo. Maybe that second compartment is thought to hold a rain cover, it does not make sense otherwise. It is confusing that the zippers of those two pockets run in opposite direction. 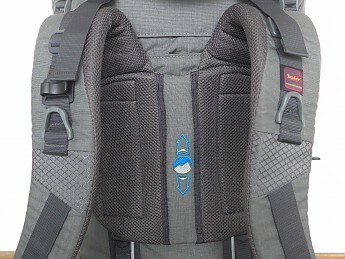 The zipper on the mesh inner lid pocket is on the wrong side. With the lid open (of course) it is on the lower side instead of the upper, so content can fall out. The orientation of the top draw cord and bottom eyes should be turned 90 degrees. I have a very dull colour, literally mid grey. There are some aspects of this standard model, and trends in general, that I regret. The long existing feature of a separate lower compartment is nonsense. I always keep the division open and never use the opening. I would not know what to use it for. I usually want to store long objects like a tent and a mattress, and it makes storage less efficient in general. It adds extra weight, complexity, cost, and a point of failure. 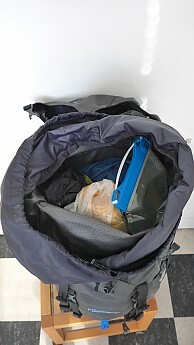 Getting stuff out through the bottom opening would probably work (if it is there), compactly repacking without over straining the zipper would be hard. That division preceded the trend of adding ever more zippers. On the sides, the front, or even all around. A nightmare to me. 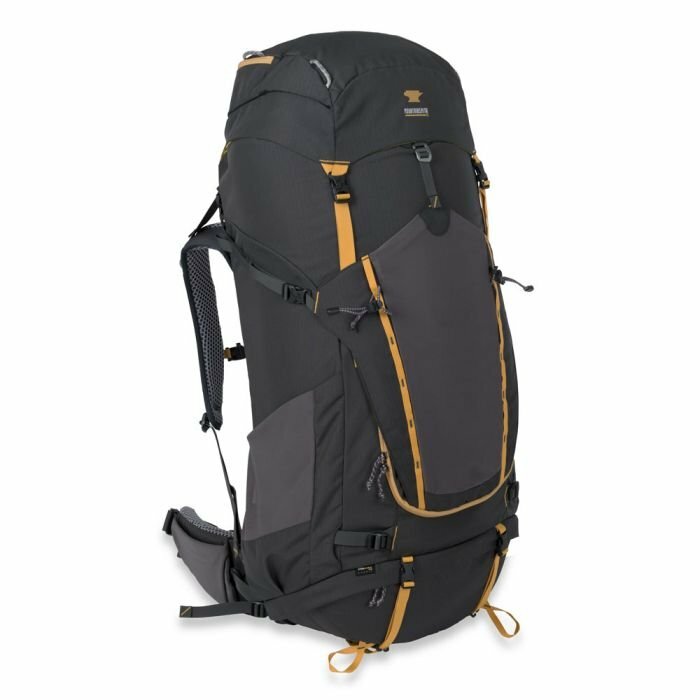 I do not need them, and I imagine the zippers bursting, everything piling out, and no way of carrying my stuff any more. Thumb loops are nonsense too. Arms are bent far too much, veins and nerves obstructed. There is also a trend of adding gadgets as selling points. Lots of them are not that useful or practical. 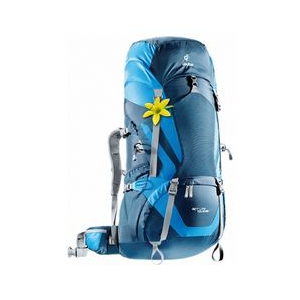 In this case: the extra handle, those key cords, the tucking gimmicks (velcro and elastics), and the two daisy chains on front. The latter invites the silly hanging of a 2.000 kilograms capable carabiner to attach a dangling teddy bear or drinking cup. I only used it to attach my poles. Many parts are over dimensioned and too heavy, like the hip belt padding, and compression and stabilisation straps,. There was unnecessary padding on the shoulder pad and above the waist. Those parts are barely touched, or not all. I have started some adaptation, as you would expect from above list. It was just aimed at first use. I will not go into all the details. Shed some weight. I had a back start compared to the expected 2000 grams. I removed some of the useless features, harvesting some 180 grams so far. You can see an overview in the picture. Some explanation: I removed the frame crossbar, centre lid drawer, compartment divider, and the extra shoulder padding (picture). I tried to do it as neatly as possible, instead of just cutting parts off. I needed a standard sewing machine with thicker thread and needles, a hot knife, and a drill. 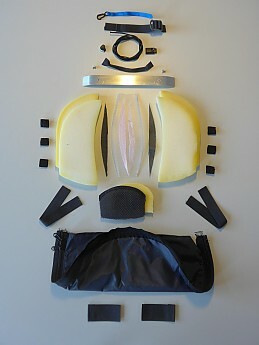 I only needed a cobbler to sew back the shoulder pad after removing inner parts. Added a cover over the two top pocket zippers (picture). I intend to do some more adaptation. If ever, I will report here. Move the drinking pouch. That’s quite some work. Remove the zipper of the lower entrance and just sew it close. Also remove the lower frontal straps with buckles. Quite some weight loss there. Move the two lid drawers inward, to compensate for the removed centre one. Add a second axe loop and move the first. Remove the last key cord. Maybe shorten the side straps. 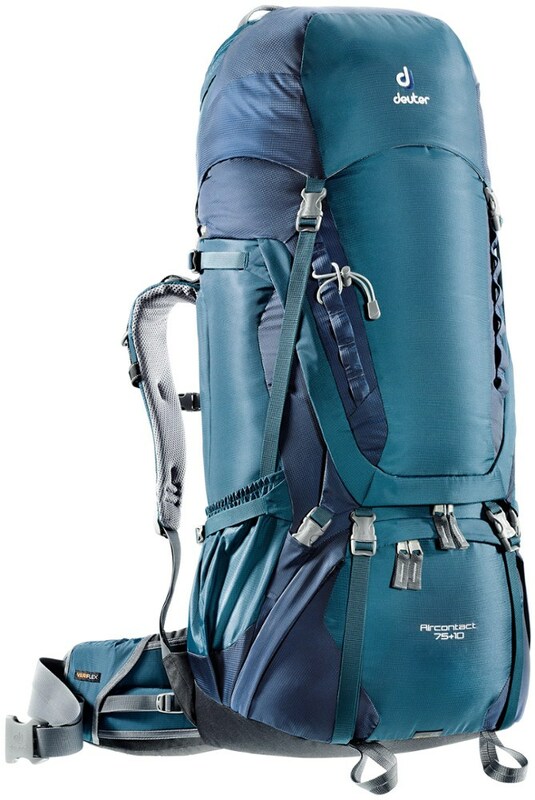 I usually do not carry anything there, except skis. Good luck with the pack medications, Capricorn. Out of curiosity, how much did you pay for it secondhand? Well alright, I paid 70 euros plus expenses. The Tashev Kentaurus 80+15 is not available from the stores we monitor.